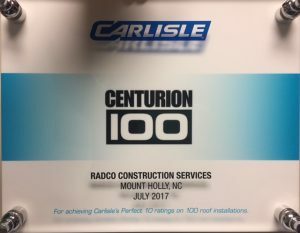 At the beginning of August, Radco Roofing was officially welcomed into Carlisle Syntec Systems’ Centurion level of applicators. The designation is awarded to those roofing companies that have successfully completed a minimum of 100 projects with “Perfect 10” results. Quality workmanship, professionalism, and commitment to recommended installation practices are all considerations in earning a “Perfect 10” on any project, and to have completed 100 of them is an achievement Radco Roofing is proud to receive. 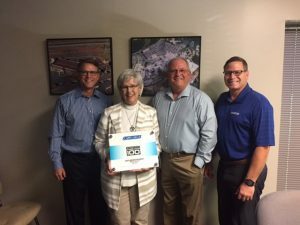 On behalf of all of us at Radco, thank you to Carlisle Syntec Systems and to all the clients who have trusted both us and Carlisle for their roofing needs.